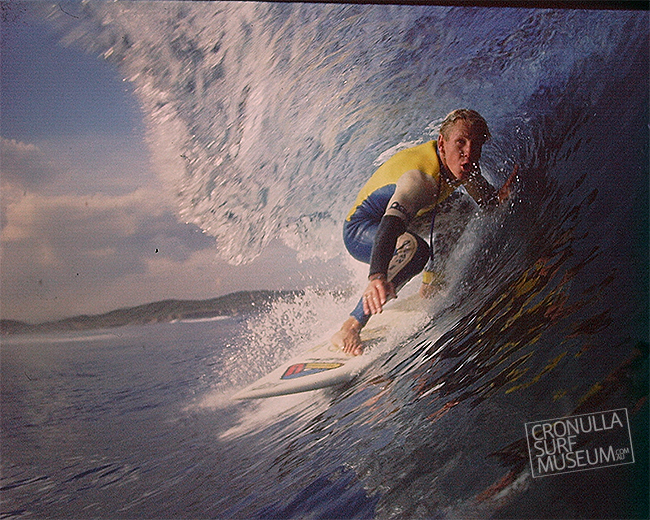 Dog was one of Cronulla’s most successful competition surfers in the 80’s and 90’s both Professional and Ametuer, well known for his rock n roll look,g rinning smile and ability to get heavily barrelled. Photo Chris Stroh Greenhills way Mid 80’s. Young Doggy back in his Daniel Surfboard days looking very determined to make this heavy local reef dredger as it jacks up and drains the reef nearly dry. Dog used similar determination to reach the top ranks of Pro Surfing throughout the late 80’s and 90s as a regular Top 16 finnisher. Photo Chris Stroh around ’85. No wonder Cronulla surfers are so proud of their waves. We have some of the best reefs on the East Coast that produce all shape and size conditions. This spot was the full secret spot when this shot of Dog was snapped around mid 80s riding his Daniel Surfboard and Peak Wetty, photo Chris Stroh. Richard Dog Marsh was another of Cronulla’s famous Goofyfoots. Right up there in the same company as local legends like Pete Smith, Banksy, Occy, Craig Naylor, Fanga, Greeny, Murph and Andy King to name just a few, Dog was one hell of a cacky foot tube rider . This shot was taken at one of those reefs that is better left unnamed. Photo Chris Stroh Mid to late 80’s. Richard Marsh scores one of his first covers on Tracks Nov ’85 photo Simo.